You sprung in my life like the sudden blooms of spring. 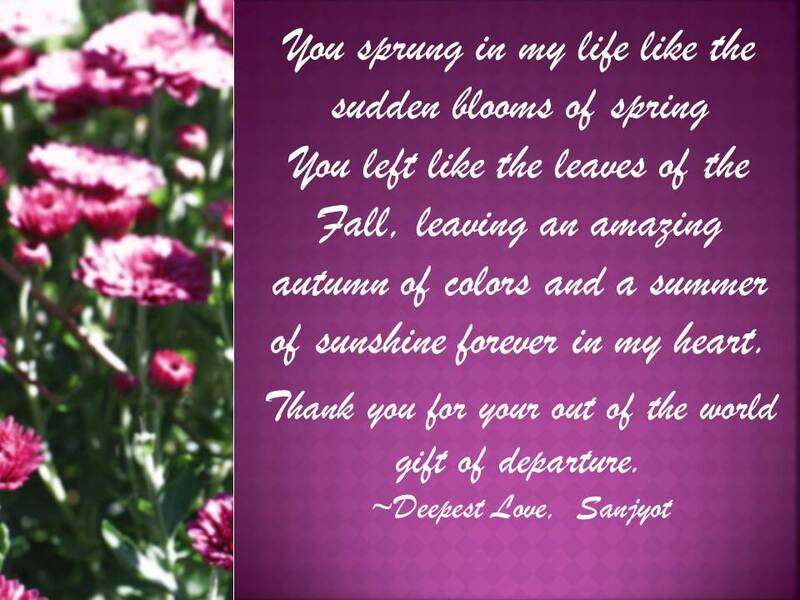 You left like the leaves of the Fall, leaving an amazing autumn of colors and a summer of sunshine forever in my heart. This one is dedicated to a very dear one, who departed on this day several years ago… In deepest love and gratitude truly cannot be expressed in words. and a summer of sunshine forever in my heart. Thank you for your out of the world gift of departure. Categories: Uncategorized | Tags: amazing, autumn, COlors, deep, departure, Forever, Gift, gratitude, Heart, life, Love, spring, summer, sunshine | Permalink. Wonderful to keep love alive in the heart. Thank you. Love is healing and goes beyond this physical body and hence eternal. Thank you for visiting!! !